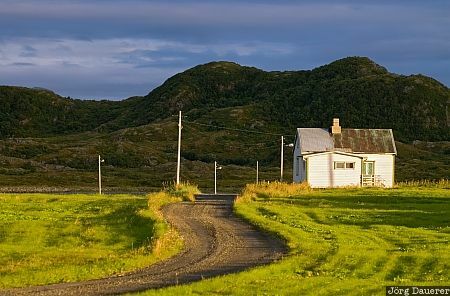 A white farmhouse and a gravel road leading to it through a green meadows in Sandøya. Sandøya is on Vestvågøy, an island of the Lofoten archipelago in Nordland in northern Norway. This photo was taken in the evening of a sunny day in August of 2010. This photo was taken with a digital camera.